Israel said Thursday it's destroyed nearly all Iran's military sites in Syria, as part of a missile firefight between the two nations that started late Wednesday. The Israeli military said it hit a logistics headquarters in Kiswah belonging to the Quds Force, an Iranian military logistics compound, and the group's munition storage warehouses at Damascus International Airport. "Tonight, we conveyed an important message to Iran and to the Assad regime: a message of determination and strength," Israeli Public Security Minister Gilad Erdan said late Wednesday. Israel said the missile strikes came after 20 rockets were fired from Syria into Golan Heights overnight. The overnight exchange was the largest-ever direct clash between Iranian and Israeli forces, and appeared to be the largest exchange involving Israel in Syria since the 1973 Yom Kippur War. The battle comes one day after the Syrian Observatory for Human Rights said Israeli airstrikes killed at least 15 people, including eight Iranians. The Israeli fighter jets struck a Syrian army position south of Damascus, a pro-Assad commander said. Syrian air defenses then intercepted several rockets from Israel targeting Syrian positions in Golan Heights. "This was by far the largest strike we have done, but it was focused on Iranian sites," Israeli military spokesman Lt. Col. Jonathan Conricus said. 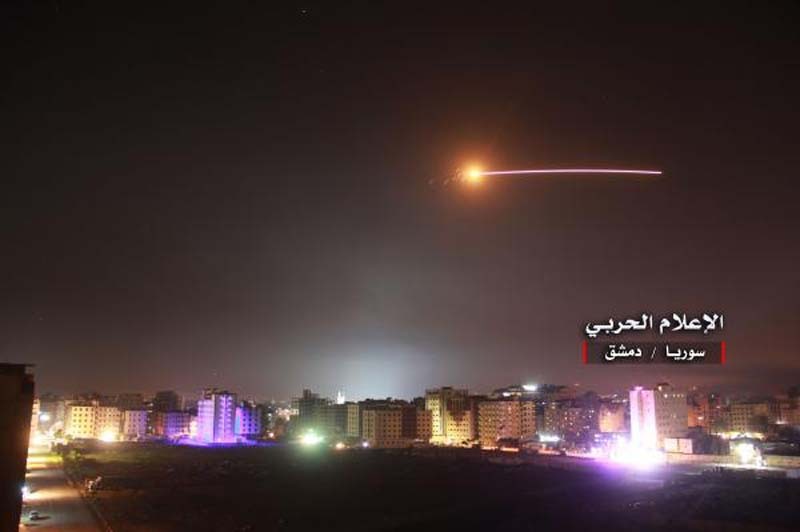 Syrian air defenses were said to be "confronting a new wave of Israeli aggression rockets and downing them one after the other." Russia's Defense Ministry said Syrian air defenses downed more than half of about 70 Israeli missiles launched into Syria Thursday. Israeli Defense Minister Avigdor Liberman warned Tehran Thursday that strikes on Israeli territory will be met with the "strongest possible force." "If we get rain, you will get a flood," Liberman said at the annual Herzliya Conference. "We will not let Iran use Syria as a base to attack us from." Tel Aviv forces were expecting Iranian retaliation after Israeli Defense Forces carried out a strike last month that killed seven Iranian troops at an airbase.